Last week end I drove my car to San Antonio and met Ayden, my granddaughter, and my daughter-in-law, Jennifer, in SA. Ayden had to participate in a championship cheer leading competition. What a hoot that was!!!! Thousand of girls from all the gyms in TX competing against each other. The TX school districts were also competing but not against the gym participants. They were from all over TX and all ages. The requirements for cheerleading were to have your hair in a pony tail or a curly bun, a colored short outfit and glitter on your eyes to match your uniform. You MUST have a BIG bow or ribbon in your hair to match your uniform and eyes. The other requirement is for the girls to jump up and down, practicing the cheers and do cart wheels every where they walk. They did a great job of doing that!!!!!! When 2 days were over everyone was dead tired from either watching the cheerleaders or being a cheerleader. I imagined cheerleaders getting up doing a cheer and being judged. No such thing!!!! You can not hear the cheerleaders doing their routine because every cheer is being done to a loud rock and roll song being blared out to the crowd. The crowd is sitting in the dark with lights only shining on the cheerleaders. It is expensive to get in for some people. If you are a little sister or brother and being drug to the competition by your parents you get in free. If you a participant you get in free. If you are a parent or a friend you pay $30. If you are older than 60 you get in free. I told my son that was nice of them to let the grandparents in for free. He went on a rant and said that meant grandparents would buy things for the granddaughters and spend a lot more than if they had been charged. That was absolutely correct. I bought a t shirt, sweatshirt and a few minor things which added up to a lot more than $30. I am busy getting ready to go on a trip to Belize with my sister and her husband. We are going to have a blast. I know some people are wondering what happened to me or what I am doing. As the title reads Life Goes On. And it does. I miss and think about Rick everyday. That will never change. I found if I sat in the 5th wheel all day I could find myself getting very depressed. So I forced myself to get out and join in some of the activities in the RV Park. Everyone says don’t make any decisions for a year as to where I will live and what I will do. But I have done some research and thinking about what I will do and where I will live. Here are some of my ideas. I have always liked the idea of a Dell Webb type of community. That is a 55+ gated community with a large clubhouse with all kinds of activities. You have to buy a house there. The problem with these type of communities they are not located near where I want to live. I have looked at several in Texas. I wish they had one closer to my sons and families in Dallas. The ones in Dallas are about an hour or so away and through lots of traffic. I could pull my 5th wheel up to Dallas and live in it. The problem with that is the winters in Dallas and there are not any nice RV Parks near the family. Or I could leave the 5th wheel here in South Texas. Last summer was very hot here though and I do not want to stay here during the summer. Very few people stay here in the summer as they all leave and go back up north. I might go somewhere that is cool in the summer. A couple of summers ago Rick and I spent a month in Ruidoso, NM. It is up in the mountains and the high is about 85 degrees. Now there is a problem with me pulling the 5th wheel everywhere. I have never pulled it and it is very big. I have had several people offer to drive it where I want to go or offer to teach me how to drive it. I will take them up on the offer to teach me to drive and pull it this spring. I know I could drive it. The problem with that is I have always felt sorry for just one person traveling and pulling a big 5th wheel. It is much easier with another person in the truck with them helping navigate and being another set of eyes for the driver. I have another idea about pulling a trailer. I could leave my 5th wheel here in South Texas and buy a small trailer (about 24 ft.) and pull it to different places during the summer. For instance I do not think it would be a problem to drive it up to NM. I would still take driving lessons for the small trailer. 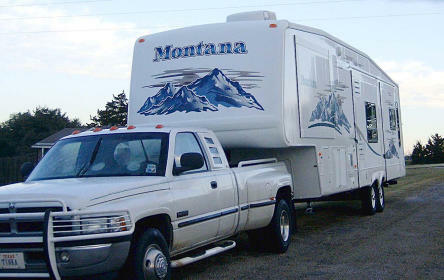 Then I could drive it to Dallas this summer, stay a few weeks and then drive to NM. I could just buy a house in a regular neighborhood around Dallas and live near the family. But I do not want to live in a regular neighborhood. There are a lot more activities in places like I have described. I have a few trips planned but I will leave that for another blog. If you are reading this I thank you for still being around. If you have any wonderful ideas about decisions I should consider leave a comment. I know you all must wondering why we quit writing so many blogs this last year. The website is called R-V There Yet? But the real link to this blog is www.tinka.net. Many people think that I, Tinka, write this blog. I can not take credit for it as Rick is the creative writer in the family. It was my idea to start and write this blog when we first started traveling in the RV but it wasn’t long before Rick’s creative juices started to flow and he wanted the job. When we first started traveling it was easy to come up with ideas and blogs to write because we had lots of fun adventures to describe. This last winter it became harder and harder to come up with creative subjects. There definitely was a reason and one that Rick did not really want to dwell on too much in the blog. Lot of our family and friends knew what was going on in our lives though. I have put off writing this particular blog for several months because I knew it would be so very sad and painful for me. Rick passed away on June 25th, 2011. We had spent most of the winter going to doctors, to chemo and fighting cancer. Last fall Rick had a colonoscopy and they found a malignant tumor which was removed successfully. We felt very lucky that it was found in time . But the doctors said Rick needed to take chemo as a precaution in case the doctors had not gotten all the cancer or left even one cancer cell. We spent most of the winter sitting in the Oncologist’s chemo lab. Rick had an MRI and it showed that Rick had 2 spots on his lungs. Until the doctors could do a biopsy we would not know if they were malignant or not. In the spring Rick was finished with chemo and they said he was free of colon cancer. The doctors decided to do a biopsy of the lungs and found the 2 spots were malignant. Besides this Rick had several other problems with his lungs. First, he had been a smoker and the MRI showed he had COPD (chronic obstructive pulmonary disease) which includes emphysema in the right lung and bronchitis. The pulmonary doctor gave him a breathing test and it showed he had a problem with exchanging carbon dioxide and oxygen. The doctors decided to remove 1/2 of his left lung which contained the malignant spots. The surgeon came in after the operation and said Rick was cancer free. After staying in the hospital for a few days Rick came home and was doing fine. Then he started having trouble breathing. He was not getting enough oxygen and then his heart would start pumping very fast to get oxygen to his heart. Even with oxygen from a machine he was having trouble. Besides all those problems they decided the colon chemo had damaged his lungs. The doctors were going to do a tracheotomy to help with his breathing. They had to wait a few days to do this as he was on Plavix which is a blood thinner. But Rick’s heart just could not handle the breathing problems and it just gave out. He passed away on June 25th. We had his memorial on July 9th in the Dallas area. We all face many tough times in our journey through life. This is the toughest one I have ever faced. He was my best friend, soul mate, lover, confidant and my strength. All the goals and dreams that Rick and I shared have vanished. I suddenly lost the future that we had together. It is hard to accept that he is gone. There are days I think he will show up soon. We are told we are not supposed to ask WHY but I do. WHY Rick? He was too young to die (65 years) and I am too young to have to live without him forever and use the old word “WIDOW”. I have a lot of decisions to make now. I know the saying “Not to do anything the first year”. But I have more decisions to make than most. We sold our house when we began RVing. (1) I never learned to drive our big 5th wheel. I know that some women do drive 5th wheels but my opinion is that the driver (man or woman) needs another set of eyes to help drive. I certainly helped Rick while he was driving. (2) It wouldn’t be as much fun traveling around by myself. Part of the fun was sharing the experience together. (3) Do I want to trade the rig in and buy a house? (4) Where do I buy a house? The most logical place would be in the Dallas area where our kids and grand kids live. (5) I do like the warm weather in the winter time in South Texas though. I am sure as time goes by I will decide what to do. But no matter what I decide I won’t have my precious Rick beside me. I have a couple of blogs to write after this. This blog will be left up for a week or so and then I will post a new one. After that I will try to post one or two every month for a while. I thank all the readers who have been with us during our travels. Rick and I certainly had a great time and hope you enjoyed the ride with us. Rick, thanks for all the great blogs you have written. I know you are in God’s hands now. I hope you are in peace and can breath easily and not in any pain. Give a hug to your parents, Nelle and Walt, and your brother, Bob who we all lost in the last few years . Rick, you will never be forgotten!!!!!!! I love and miss you so much. Rick had a great sense of humor and always made me laugh. Today is my mother’s 94th birthday. Next month I will go up to Kelowna, BC and visit her and my sister. Actually I will go up and visit with Mom while my sister and her husband go on vacation and take a break from being a caretaker for her. Happy Birthday, Mother and also Happy Birthday to my cousin, Trisha, who shares the same day. Many of us in RV’s were faced with a recall of our Dometic Refrigerators a couple of years ago. Well, the cure can be worse than the disease. The recall resulted in replacement of the cooling unit of the refrigerator. It turns out that there is a technique to replacing the unit without damaging the inside wall of the refrigerator. In our case, and others we’ve encountered, the inside wall was damaged just below the cooling fins. This allowed the condensation to drip between the inside wall and the outer case. 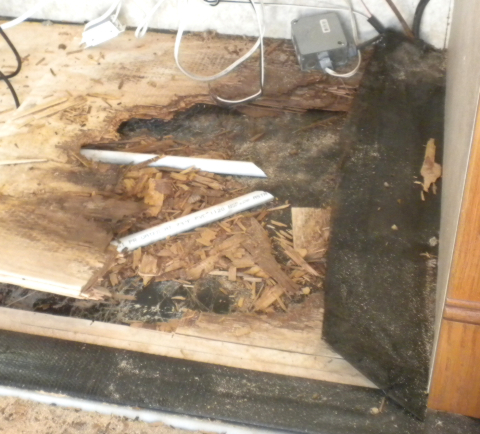 After 3 years of this, the plywood floor decking started to give underfoot. The problem lies in the fact that the floor is on the slide out. 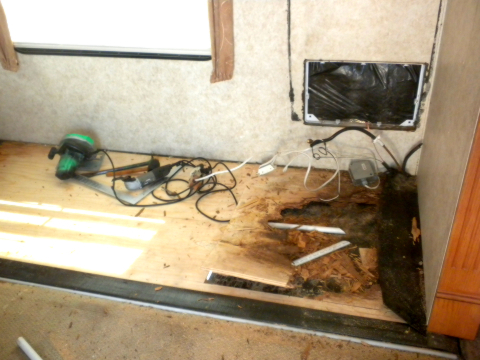 The carpet, refrigerator and associated cabinet had to be removed. 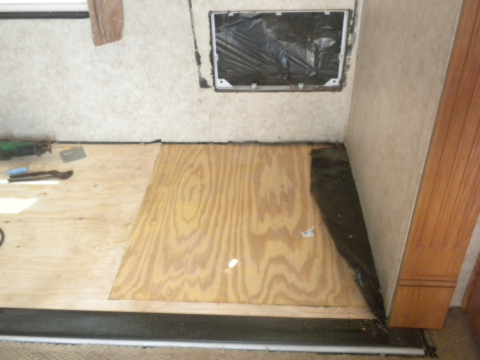 The plan was to replace the damaged section of the floor with a patch of 5/8 inch plywood. 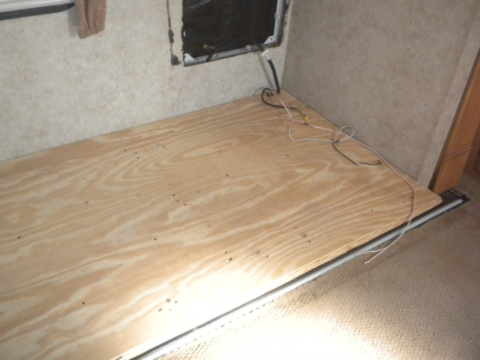 And then we added another layer of 5/8 inch plywood on top and fused the two layers together with glue and anchor screws. 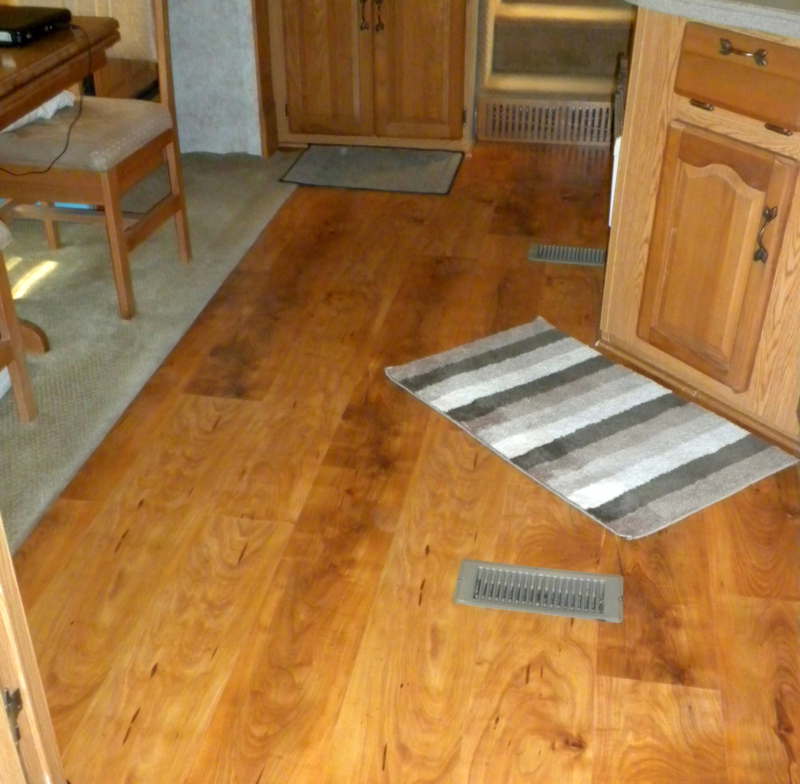 The inside edge is tapered at about a 30 degree angle to facilitate the blending of the carpet once it is reinstalled. 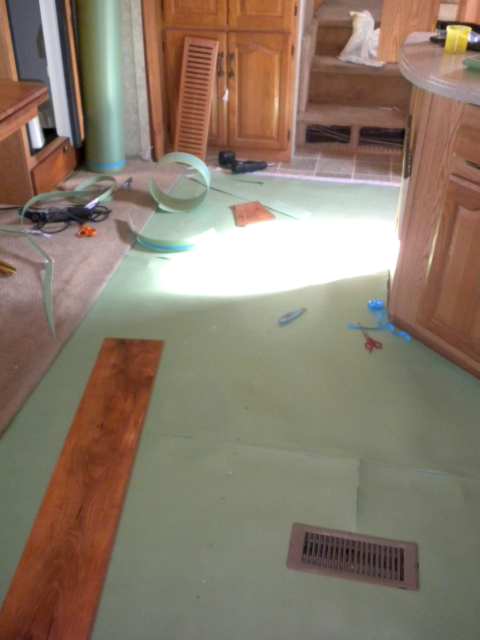 The refrigerator cabinet had to be modified to allow for the extra layer of floor. 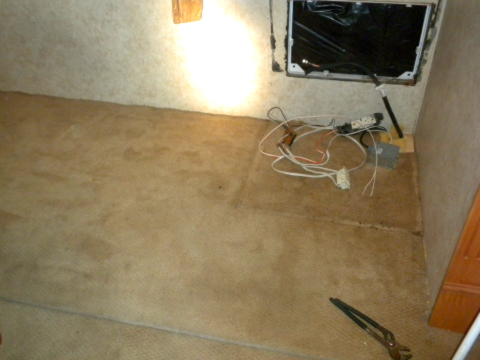 Then it is a matter of replacing the carpet. The key to the entire project was repairing the leaking frig. The crack was sealed with caulking and the condensation now flows to the outside via the drain hose. Before you get really impressed, another key to this repair was finding someone with limitless talents of refrigerator repair in Denver and the proper tools. We did with Jerry Dietrick. Two tools that came in handy were Jerry’s multi-tool for critical sawing and my pneumatic brad/staple gun. A table saw was used to remove 5/8 inch from the refrigerator cabinet sections. Not only did Jerry make most of the repairs and modifications, but he and his wife washed and waxed the entire rig, taped the slide-out edges, and applied UV protection to the roof. We were lucky to have them available. They left to return to Iowa just after they finished our project. If you have had a refrigerator cooling system replaced, be sure to check the back wall of the frig to be sure that it is not leaking. If it is, get it fixed before you have a major project.